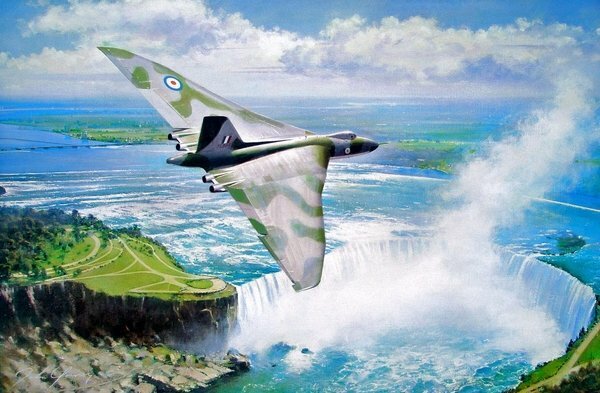 Paper Size: 30" x 23"
First designed in 1945 the Avro Vulcan first took to the air in 1952. This new and radical design incorporated many new advances devised during WWII, enabling the Vulcan to reach higher speeds and altitudes. "Lone Ranger" was the Royal Air Force's code name for special training flights routinely flown around the globe. Shown here is a typical public appearance of a "Lone Ranger" flight with the backdrop being the awesome Niagra Falls.